Liu Cixin’s alien invasion trilogy (usually called the Three-Body Problem trilogy, but more accurately named The Remembrance of Earth’s Past), which examines the fall of humans through a colonization process that sneaks in through technological and psychological means, has a scope encompassing galaxies and the fate of the Earth through a Sinocentric lens. Lesser known in the Western Anglophone world is Liu Cixin’s short fiction, a small sample of which is now presented in The Wandering Earth, with a team of five translators: Ken Liu, Elizabeth Hanlon, Zac Haluza, Adam Lanphier, and Holger Nahm. Of the ten stories included here, half of them won the Galaxy Science Fiction Award, which dominates the Chinese science fiction field as much as the Hugos tower over the English-speaking science fiction industry. The ambitious scope of Liu Cixin’s fiction is perhaps starker in his short fiction than in his longer work: narratives unfold over lifetimes and eons in several stories, sometimes captured in small snippets of a limited observer. There are a lot of expository paragraphs, falling into “as you know” territory, except it is clear, of course, that the protagonist does not know and must have everything explained to him (and these protagonists are all men). These expository paragraphs stretch into pages in the novels—and they are no less intense in the short fiction; their saving grace being that the short stories are themselves split into chapters, so whatever technobabble is happening doesn’t feel as endless. They are particularly tedious in first contact stories such as “Mountain,” “Devourer,” and “The Micro Era,” where there is barely any human drama and the protagonists are flat. The psychological rationality of the dramas vary: in “Cannonball,” a man wakes up from cryogenic sleep to find a society furious at him for the actions of his son, and a group kidnaps him to kill him in a tunnel to the Antarctic. However, despite the pages of historical exposition updating the main character on what has happened during his sleep, it is never quite clear how the rage of the society is justified, except as a search for a scapegoat. Still, in stories such as “Sun of China” and “With Her Eyes,” the expository paragraphs deliver hard-hitting emotional landings that are deeply moving. The challenge faced by the translators is not just linguistic, but cultural. Given the conversations surrounding multiculturalism, diversity, and the lack thereof in publishing during the current zeitgeist, there is the added challenge of choosing stories that would translate well to the target market, in this case, Chinese science fiction stories for the “Western” market. It calls into question the universality of narratives, personality types—what defines the everyman? What defines cultural specificity? Can we read them in these stories, in ways that are recognizable to our foreign eyes? The story “Taking Care of God” emphasizes filial piety, especially with the warning at the end for humanity to safeguard against the problems of old age by having children of its own. As a Chinese reader, I recognize this theme and final exhortation—I also find it tiresome, because it reflects the anxieties of my parents pushing me towards marriage and kids, but it may well land differently for a Western reader. This is the reader’s challenge: to remember that we are the foreigner to the translated texts, and it is by the generosity of translators that we have access to these texts at all. For this challenge we may ask ourselves what we expect from science fiction, and/or from Chinese fiction. We may ask ourselves what our preconceived notions of science fiction are in terms of whose narratives are centered, and whether science fictional narratives are necessarily universal, and if so, why. 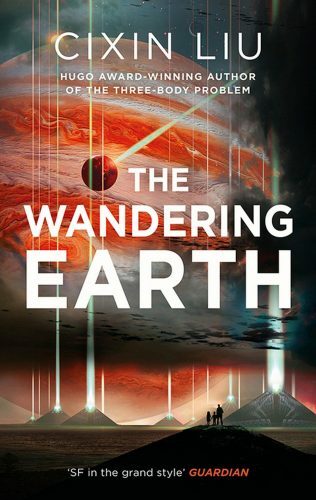 Some of these stories in The Wandering Earth may well be universal, at least according to an unmarked male perspective: the title story chronicles the launch of Earth from the orbit of the dying Sun from the perspective of a man who lives through the eras during which humans “brake” the Earth from spinning to when it traverses its frozen path past Pluto towards a new galaxy. “Mountain” recalls the call of the mountaineer to constantly seek a new peak to conquer, here manifest in a mountain of water in the middle of the ocean created by the tidal pull of a visiting alien spaceship. In “For the Benefit of Mankind,” a highly trained assassin is hired by the wealthiest people of China to murder specific poor people who have rejected money, for reasons to do with colonizers from another planet (who are themselves escaping their own bizarre class war). Women are not particularly vilified, but they are consistently underdeveloped in favour of the male protagonists. Liu’s premises are enormous in scope, but also outrageous, with enjoyment to be had in the small details that continually escalate the premise. This takes on a comedic effect in “Curse 5.0,” in which a jilted woman’s tiny virus code eventually becomes tweaked by other coders to have devastating proportions. This devastation is inadvertently triggered by characters who are actual self-inserts of the author and fellow Chinese science fiction author Pan Dajiao (Pan Haitian), impoverished by their creative endeavors. Ridiculousness lies in throwaway lines that parody various pulp fiction tropes and escalating tweaks to the code. The ridiculousness can paper over the ethical questions raised as well. In “Devourer,” a dinosaur alien empire’s spaceship comes to strip Earth of its resources and render humans into livestock. Alongside the long descriptions of negotiations for survival and attempts at subterfuge are ruminations on perspectives of scale, time, and what constitutes a society: in the face of humans asking to be spared to preserve tens of thousands of years of civilization, Emissary Faingsh (or “Fangs”) gestures to a civilization of ants that, having survived through the Pleistocene era, is destroyed in an excavation by humans. Later in the text, after the war between the aliens and humans, the humans find it in themselves to recognize the heart of the alien. On the one hand, the text is asking the reader to identify and recognize the humanity of an alien. On the other, the alien is a genocidal colonizer. On a third hand, the genocidal colonizer is a giant thirty-foot-tall dinosaur. “Is it very far?” Ma asked. “Very far, Ma,” Shui answered. “Farther than the Moon?” Pa asked. This is the dream and justification of science fiction: that science fiction inspires us to look beyond our narrow perspectives out to the world and stars, to be part of the universe beyond that which we know possible. In his science fictional contemplations of what we might call “deep time,” that stretches for aeons past the reckoning of human lifetimes, Liu also adds that wistful reminder of the things we leave behind as we seek to go beyond—family ties, old dreams of contentment, and human history.